The DF-A0047 is a handheld wideband direction-finding antenna, which has been used in multiple application areas. One of the more popular uses is ‘interference hunting’, whereby the antenna can be used to find a source of emitted interference by using received signal strength together with readings from the built-in electronic compass. As an example consider a radio system consisting of a receiver and multiple transmitters. Another transmitter in an unknown location is transmitting signals that are interfering with, and blocking signals from transmitters in the first system from being received. 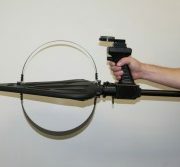 In some instances, a source transmitter signal is identified by using an omnidirectional antenna, for example, on the roof of a vehicle, by driving around to find a circle inside which the interference source is transmitting from. This could typically be a large physical area. The DF-A0047 is then used in the identified area to find the source of the interfering signal on the ground. 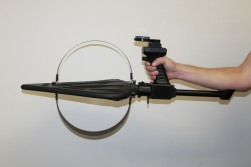 The handheld antenna is pointed towards where the highest signal strength is found in one location. This is then repeated in one or two more locations. The results are then triangulated to find where the signal source is originating. The antenna combines several antennas in a neat and compact housing, providing an all-in-one direction finding system covering a very wide frequency band as an alternative to using multiple antennas to perform the same function.